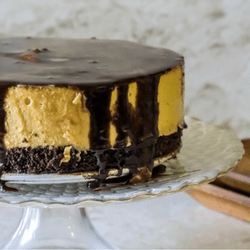 A peanut butter cheesecake with a chocolate brownie crust, covered in chocolate ganache… oh yes! And it’s gluten-free and sugar-free. Can you beat that?! I think I just may have outdone myself with this recipe. No, really. I even got this recipe right on the very first try. That doesn’t happen very often. I’m often asked how I come up with recipes. It’s usually a long slow process. I come up with a vision for a recipe. Then I make my best guess at how it should be made and record every ingredient. Then, the long part…revisions. Very rarely does a recipe turn out just how I wanted the first time around. It often takes a lot of tweaking to get it just so. This one hit the spot the first time around. Woot! 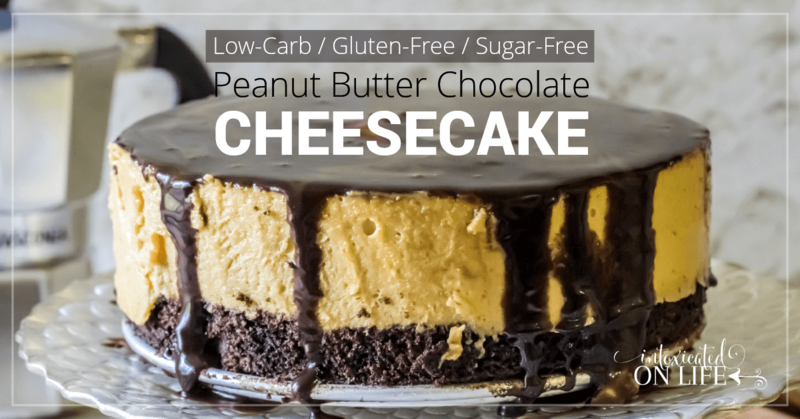 This cheesecake will take a bit of time to prepare, so be forewarned. It’s not one of those throw-together-on-short-notice types of desserts. You’ll have to allocate a decent amount of time and make it the day before you’d like to eat it. Cheesecakes need to sit in the fridge overnight to reach their optimum potential. I know it’s hard to wait, but you can do it! As for the ganache in the recipe— yes, I know this isn’t a true chocolate ganache. True chocolate ganaches’ are made with chocolate not cocoa. But I’ve messed up more than a couple true ganaches in my lifetime. I wanted to provide you with a more fool-proof ganache-like recipe. Nobody likes a lumpy ganache. And with a recipe as involved as this one, we don’t have time to be making a ganache over and over again! This is an easy to make recipe for ganache, not fussy at all. If you’d prefer a true ganache, Google has you covered. You’ll find plenty of recipes with a quick search ;). Are you ready? 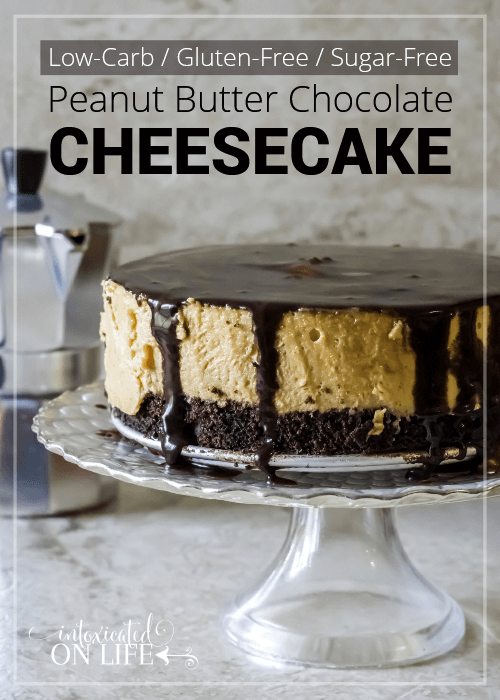 Let’s get started making peanut butter and chocolate cheesecake! 1 pound cream cheese (2 blocks) at room temperature. Liberally grease a 9" springform pan with butter or coconut oil. Mix all of the above ingredients together until well-blended. Pour the batter into the springform pan, being sure to spread evenly. Bake for 12-15 minutes or until the crust is set up. Let cool. After you take the crust out of the oven preheat the oven to 500 degrees. If you haven't yet, be sure your oven is preheating to 500 degrees. Cut your room temperature cream cheese into 1" cubes and beat for approximately 1 minute. Scrape the sides of your bowl with a rubber spatula. Add 2 eggs and beat for 1 minute. Scrape your bowl again. Add 1 egg and 1 egg yolk and beat for 1 minute. Scrape your bowl well. Add peanut butter and cream cheese. Beat for one minute and then scrape your bowl. Add the xylitol, stevia, vanilla, and salt. Beat for at least 1 minute, scrape your bowl being sure all ingredients are well incorporated. Pour your cheesecake batter into your springform pan. After you remove the cheesecake from the oven, run a knife between the cake and the pan. 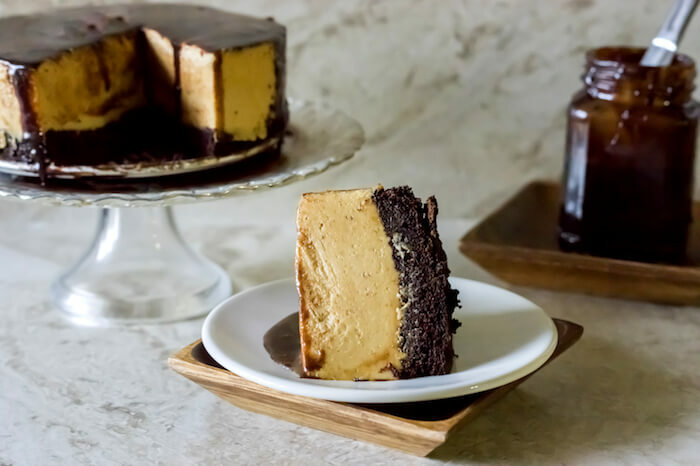 Once the cheesecake is cooled to room temperature, cover with chocolate ganache (recipe below). Pour your cream, butter, and sweeteners in a double boiler over medium-high heat. Measure your cocoa into a medium mixing bowl. Once your cream mixture is just about to boil, pull it off of the heat and pour it on top of the cocoa. Let it sit for 5 minutes without mixing. After 5 minutes, whisk the mixture until there are no lumps left. Pour the ganache over the cheesecake (you may not want to use all of it, I didn't). Cover your cheesecake tightly with plastic wrap and refrigerate overnight. If you have extra ganache, may I suggest covering some strawberries? Refrigerate your strawberries for a couple of hours—it makes an awesome treat. If you try this recipe, I’d love to hear how it turns out. Be sure to share in the comments! Xylitol has kind-of a minty cool feeling about it. Can you taste that in this recipe, or does the fat tone it down all the way? Nope, I didn’t notice any cooling effect in this recipe and my friend (who serves as my cheesecake guinea pig 🙂 ) didn’t notice any either. I find that as long as you don’t use too much xylitol you don’t get that cooling sensation (it’s actually one of the reasons I prefer xylitol of erythritol – I find the cooling sensation more prominent in erythritol). It is also part of the reason I typically always pair xylitol with pure stevia extract because it allows me to cut down on the xylitol a lot. That, and I like the taste of the two sweeteners combined better than just either of them on their own. Hope that helps! I want to try this recipe. 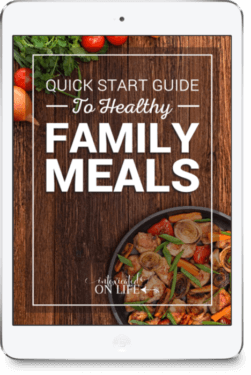 I can’t eat almond flour – can I substitute with coconut flour? Thanks. I’m sure you could, but you would need to use MUCH less than the almond flour. Coconut flour absorbs a lot of moisture. 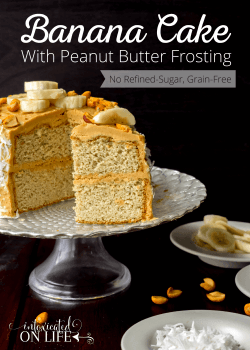 Can you eat peanut flour? That could be a good substitute too. Thank you !!! I will try the peanut flour… Great idea! Please report back and let us know how it turns out for you! It might be a good option for others who can’t use almond flour! Would you post nutritional information, please? Including carbs and calories and serving size? Thank you..
Have you gotten the nutrional values yet? Amazing recipe. We have a blog hop and would love to have you share it with everyone. Here is the link to the party. This sounds so good. I’d love it if you would bring this over to my Saturday Spotlight party to share. Hope to see you there! I think we should be friends. Why? Because your recipes ROCK MY FACE OFF. For real. 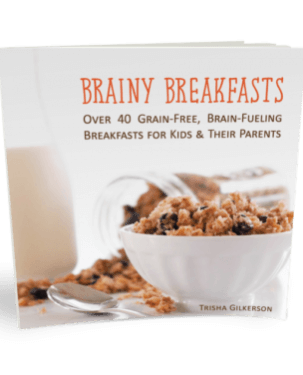 Thanks for linking up at Trim Healthy Tuesday!! That looks really amazing! Can’t wait to try it and see how it tastes! Thanks for this recipe…especially the crust. I have so many ideas for it. I did change the recipe a bit…I don’t put Xylitol in my body and I decreased the amount of Stevia cause of the taste….Which means i had to increase my cooking time. i loved it and have shared the creation with my neighbors. So, thanks! Btw…for the ganache, I added equal parts (5oz) of semi-sweet choc chips and sour cream. Melted in a double broiler and poured over the top. It wasn’t smooth (like a poured ganache…that could be because I barely heated to melt. idk), but it was yummy! Why do you prefer not to use xylitol? I know it can cause some gastrointestinal problems if some people eat too much of it. 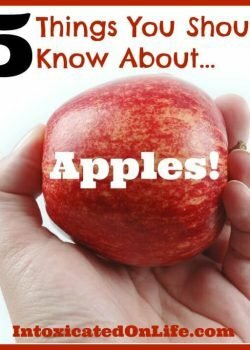 Erythritol is a good substitute if that is the case for you! Your Cheesecake looks delicious, we will really enjoy it. Thank you so much for sharing with Full Plate Thursday and hope you have a great weekend! This looks like a cheesecake I must eat! Thank you for linking up to Wake Up Wednesdays!! I’m including this post in my special round up going live tonight! Thanks so much for including us in your roundup! I’m a big cheesecake fan 🙂 I hope you enjoy it! What can you substitute for the Xylitol? I don’t have this on hand. Can you replace it with the stevia? 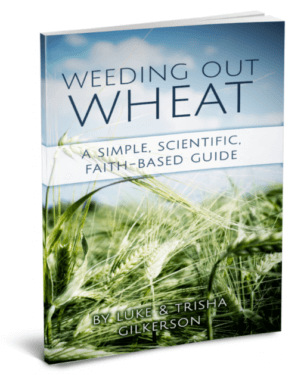 Also, can you use just use plain whole wheat flour? I would like to make this for my Dad on Thanksgiving, who’s Diabetic but don’t want to spend the extra money buying all new ingredients. You can replace it with sugar or erythritol, but not stevia because it doesn’t have the bulk you need. If you use erythritol, you’ll need a bit more. No, you can’t substitute wheat flour for the almond flour – it wouldn’t turn out the same. Is xylitol sweeter thn erythritol? I have Swerve on hand…haven’t tried xylitol except in Trident gum! Yes, xylitol is sweeter than erythritol. You should definitely be able to sub Swerve, but you might have to use a bit more. I just found your recipe and can’t wait to try it. Some of the ingredients I have never heard of. Where can I find almond flour, xylitol, and stevia extract? Each of the ingredients can be purchased on Amazon, and that’s where I purchase them from. Just click on the links in the recipe above and it will take you to them 🙂 Hope that helps! I just use natural, nothing added peanut butter! I never use xylitol, or stevia. To me stevia is not sweet at all, and it causes bad side effects for me. Xylitol will kill a dog, and I have dogs, so I don’t dare even bring that into the house. I use only Swerve, and it works great for me. I need to look for info on substituting Swerve for xylitol & stevia, I am sure that information is out there somewhere. 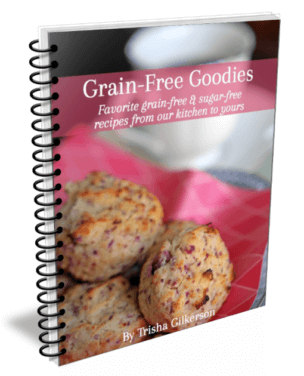 Other than your choice of sweeteners, you have some great recipes. Stevia varies quite a lot between brands and what types of fillers it has in it. I use a pure stevia extract with no fillers. It’s quite different than what you find in the grocery stores. There are reasons I do prefer xylitol to erythritol (ie. swerve). Xylitol has some health benefits that erythritol does not have. Though, certainly if you have dogs and fear they might get into your food, xylitol isn’t a good option. Your recipe calls for cream,could you use half & half?? 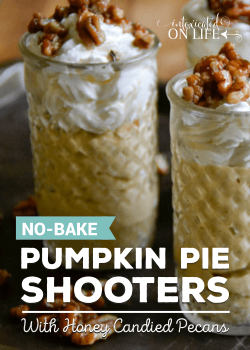 This recipe looks soooo good and I want to try it. Since it’s a fairly small amount, my guess is that it would work out OK. But, since I’ve not ever tried it I can’t say for sure!